Lucius are playing on Sunday, november 2nd, at Magnolia, Milano, for the first time ever in Italy. It was a good opportunity to email some questions to the band. Holly Laessig answered, and from her answer you can see that the band is always aiming to improve by experience and neverending work. In your country you were sometimes described as an “updated version of the classic girl group, Supremes style” and we think that these descriptions are lazy. Do you think it’s fair to include you in a purely revivalist context or do you agree with us that there’s more in your music? Of course we think we have more to offer than already exists, otherwise we wouldn't do what we are doing. But we can't take offense to small descriptions, especially at this point-it's all mostly a point of reference to attract listeners. I think once they hear for themselves they can make a more just assessment. And I don't know, the Supremes isn't such a bad comparison! Specifically, we think that in your music there is an inspiration from that kind of bands, but we like how you revitalized this inspiration and the way you did it is one of the main reasons that makes your music good. Do you agree? Are there other influences that inspired you in building you music? That era certainly influenced our melodic and stylistic takes on things but we are perpetually inspired by all sorts of times, places, people, situations, and things. The five of us come from all different worlds of music and art and have been able to explore all of these with eachother. It creates an abundance of ideas to work off of. Only recently “Wildewoman” is being sold on our side of the Atlantic Ocean, and we also found out that you had already released an album, five years ago, titled “Songs From The Bromley House”. What did we miss? Is there a hope that also that album will be sold here? Songs from the Bromley House, although under the same name, was a different project. Wildewoman is the debut record by Lucius as we know them now. We find “Wildewoman” a wonderful album, so it had to be coupled with a wonderful artowrk. We think that the mission was accomplished with that Evelyne Axell’s painting. How did you choose it? We came across it through our good friend Tika Buchanan who has worked with us as a graphic designer. She has a great eye and showed us an array of works she had come across which included Axell's. It struck us the most with its bold intensity and just seemed to be "the one". So we contacted her son and he was more than willing, but so kind and eager for us to use it. Recently a deluxe version of “Wildewoman” was released. What can you tell us about it? Is there any bonus track you’d particularly recommend? It's a compilation of live sessions, covers, and alternate takes that we have completed amidst our whirlwind tour schedule. We're very excited to share and I can't say which track I'd recommend as I change my mind frequently!-but we hand picked each track very carefully, so we hope you can enjoy them all. We read you collaborated in other artists’ records: San Fermin, The Rentals and, more recently,Tweedy. Did you enjoy these collaborations? Absolutely! We love to collaborate and couldn't say a bad thing about any of those experiences. All mentioned above have become such an inspiration to us as arrangers, performers and writers and we value all of those opportunities. 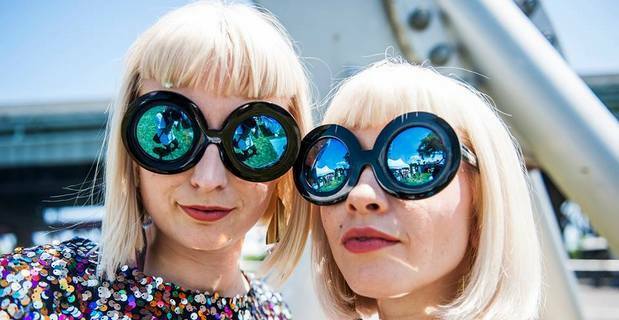 What made you choose the name Lucius for the band? I (Stefano Bartolotta) saw you live at End Of The Road Festival last September. I was impressed by how many different setups you have on stage: some songs are played with four different percussions, some other are based on guitars, or on keyboards, or are acoustic. Does this reflect what you did in the studio recording the album, or does it happen only on stage? The record was made through a series of experiments-building tracks bottom up, rearranging, rerecording, overdubbing-there was no plan. Out of that experience and overtime with playing shows, we figured out how to recreate it all live. Now that we have a designated setup (though rules are meant to be broken), I am curious to see the role that will play in this next record. That set was played outdoor on a big stage in a totally sunny afternoon; now I guess you are playing indoor in smaller venues. Do you think your live music gets the same strength on both these situation, or do you prefer one of these two? There is no preference, but certainly a difference. Festivals are fun because they are outdoors and you get to see other musicians (albeit sometimes very briefly), and feel part of a community-but because you are far from the audience and they aren't necessarily your fans there is a bit of disconnect. The sort of darker indoor grubby little clubs are often the best cause you are face to face with fans just rocking out and feeling that immediate feedback. How is the current European tour going? How happy are you to come in Italy? Were you in our country before? It's going! Going by in a flash already. We are looking very forward to Italy-it's our first time! We have had many daydreams about the food we'll be indulging in. Probably, 2014 was very intense for you, but also very satisfying. Are you already working on the next album, or after this tour you’ll take some time off? We are working on the next record, and plan to continue that after this tour until we record! Time off you say? What's that? You are surely much more popular after the release of “Wildewoman” than you were before. Would you suggest us any band still unknown and that deserves a big gain of popularity? We have so many friends who deserve that! Some bands to check out are You Won't, Elaphant, Lapland, the Happy Hollows, Pearl & the Beard...just to name a few!